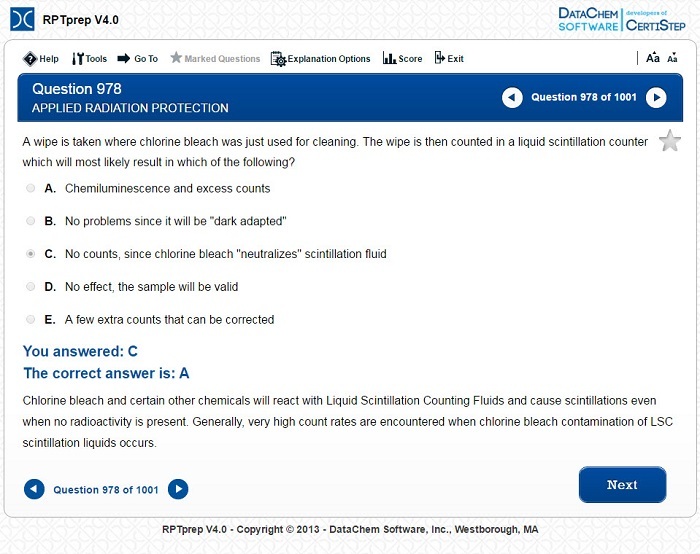 The software is designed to prepare the user for the Radiation Protection Technologist Certification exam offered by the National Registry of Radiation Protection Technologists (NRRPT). The content expert and current author for the RPTprep is Dr. Thomas E. Johnson, who has over 25 years of experience in the nuclear industry, specializing in radiation and laser safety. Dr. Johnson is currently an Associate Professor in Health Physics at Colorado State University. He has conducted multiple CHP and NRRPT review classes over the past 15 years, and currently is responsible for multiple classes in the Colorado State University’s Health Physics program. Over one-third of those passing the CHP exam over the past 5 years have attended preparation courses developed by Dr. Johnson. Dr. Johnson has a PhD in Health Physics from Purdue University and is the co-author of “Introduction to Health Physics 4th edition” as well as “The Radiological Health Handbook 4th edition” and “The Health Physics Solutions Manual”. He holds Comprehensive Certification (CHP) from the ABHP, is registered with the NRRPT, and is a Certified Laser Safety Officer. Test yourself in sequential and random order to make sure you know the subject.